Tottenham will face Chelsea in the other last-four clash, with the ties to be played over two legs in the weeks commencing 7 and 21 January. City and Tottenham will be at home in their first legs. It is a first major semi-final for Burton, who have only been playing in the EFL Cup for 10 years, having won the National League in 2009. 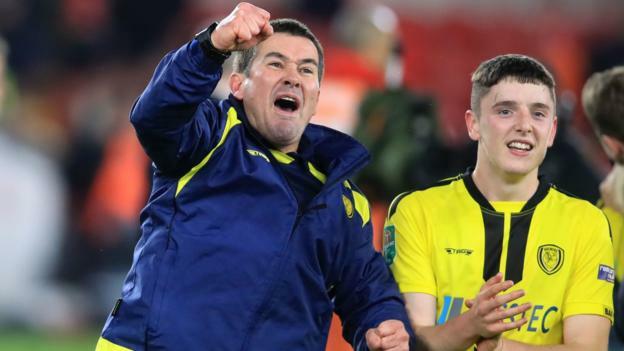 Nigel Clough’s side beat Middlesbrough 1-0 on Tuesday, becoming the first team from the third tier to reach the last four since Sheffield United, managed by Clough, did so in 2014-15. Their opponents Manchester City, who beat Leicester on penalties, have won three of the past five finals. Tottenham, yet to win a trophy under Mauricio Pochettino, qualified for the last four with a 2-0 derby with over Arsenal on Wednesday. Chelsea, whose manager Maurizio Sarri has never won a major competition, beat Bournemouth 1-0. Spurs beat Chelsea 3-1 in the Premier League in November. “We are happy because, some time ago, they gave us a good footballing lesson,” said Chelsea assistant boss Gianfranco Zola. “There are a lot of proud players in our team. Of course they will want to play this game and show we were not the ones playing in that game. Too many players under-played. European Championships 2018: British sprinting – what is going so right?